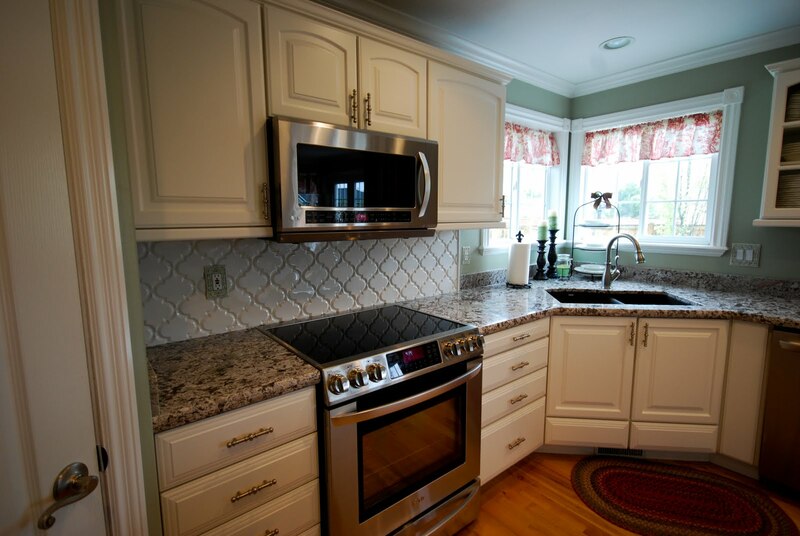 We just finished up this beautiful kitchen. 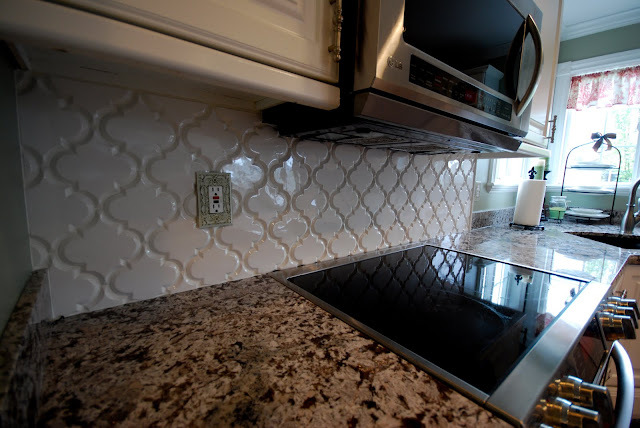 The kitchen originally had grey solid surface countertops and they had cracked (as solid surface often does), so the homeowner was looking to replace them and wanted to go with something a little warmer. She was a fun customer to work with. She had a general sense of what she wanted, but she was open to new ideas too. 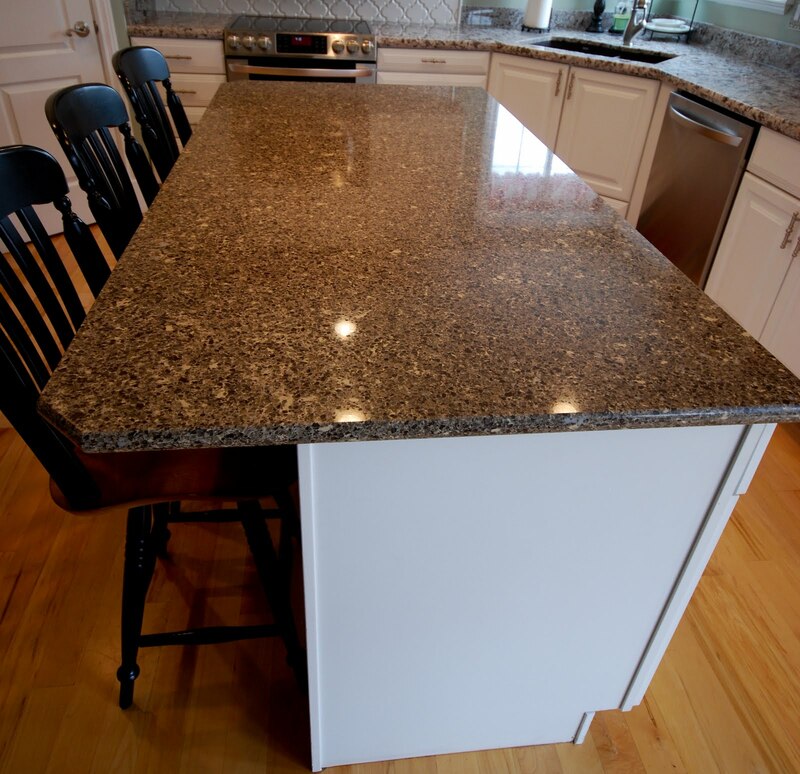 She selected Bianco Antico granite with a 1 1/2" Half Moon edge detail for the perimeter countertops. The slabs were from our current stock. The backsplash is the Beveled Arabesque ceramic tile in white from Mission Stone and Tile. These are really beautiful tiles. I had seen pictures of it online, but seeing it in person it's even prettier. They are about 6" x 5" and each tile is set individually. 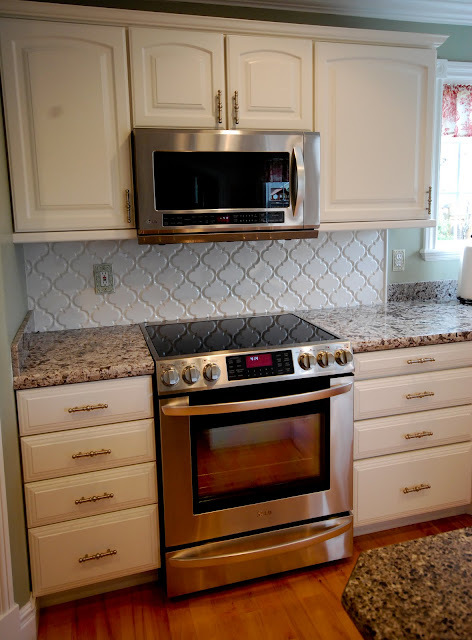 The tile was done just behind the range, the rest of the backsplash is 4" granite. 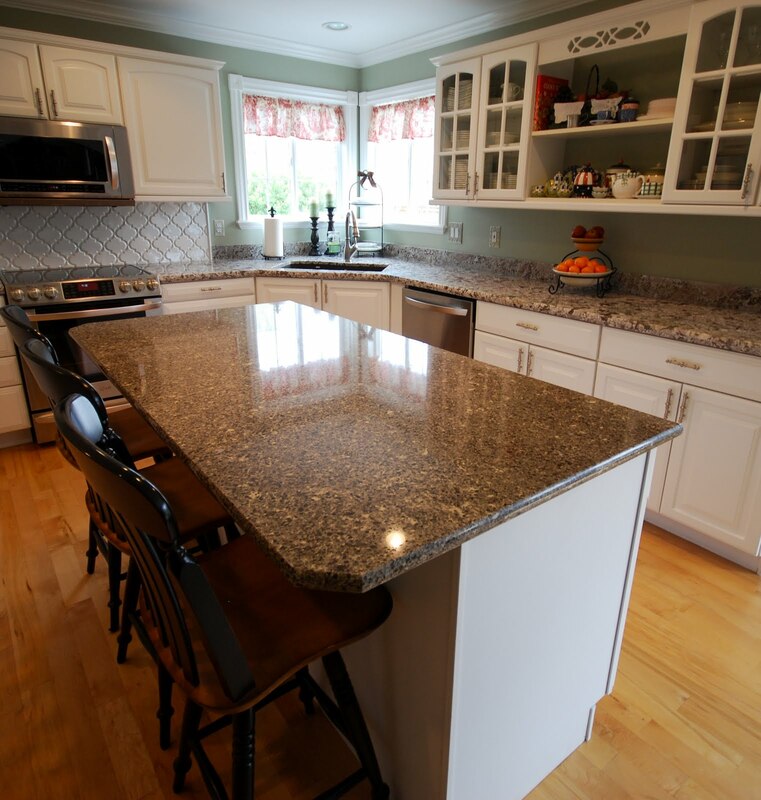 The Island countertop is Cambria quartz, the color is Halstead. The slab is 3 cm and the edge detail is a 1 1/4" Half Moon. I didn't get a picture of the sink, but she did a Blanco Siligranit in Cafe Brown. It looked great! This was a fun job, thanks to the 'G' family for letting us be a part of it! 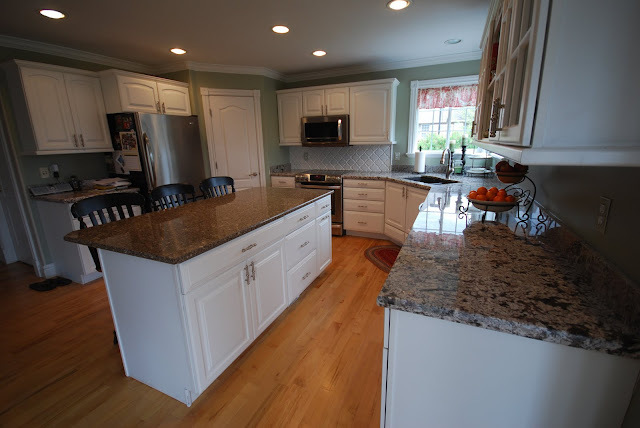 The kitchen looks great I love you choices in granite. I also like that you included the names of grantie and cuts, for the reader who is unfamiliar with the lingo this will be helpful if they plan on re-doing their kitchen in the future. Gorgeous kitchen! 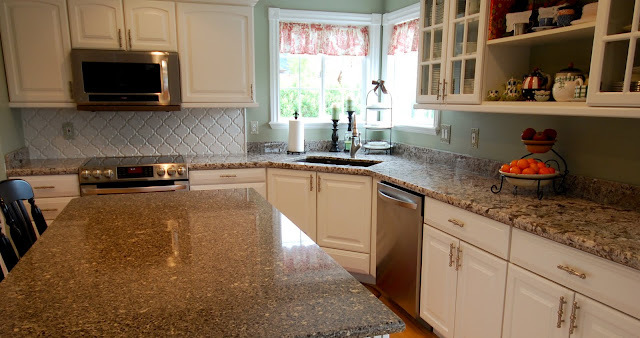 I didn't think the quartz and granite would look good together but it looks great! I love that tile too. I'm going to have to check out their website. Thanks for sharing! I'm using the Halstead Cambria in my upcoming remodel. I'm going to use it in the entire kitchen. I love how warm it is. It's nice to see it installed in these pictures, it's so hard to select off of those little samples. Looks great, love that edge detail very clean look. 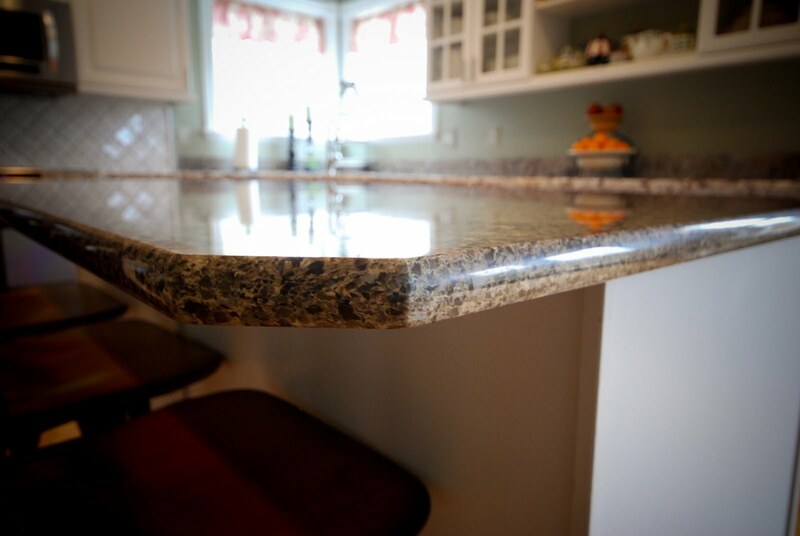 Great craftsmanship too on the countertops.